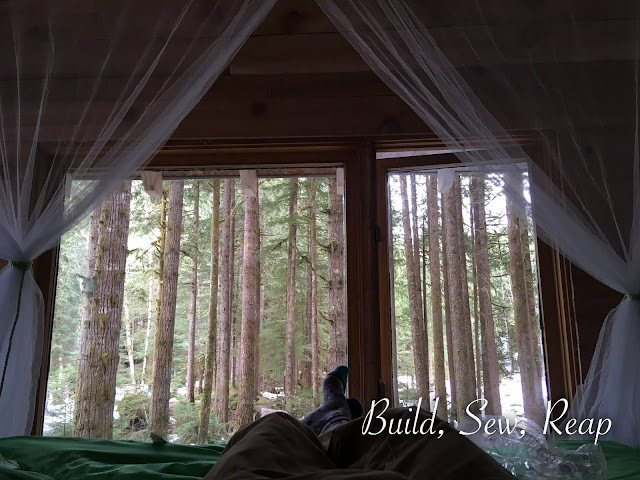 I made some HUGE progress inside the cabin over the past few weeks despite having to drag all my materials and tools in on a toboggan. I dragged in over 100 six-feet long cedar fence boards on my toboggan in order to finish the walls but they're [almost] done!! There are a few little spots here and there that need rip-cuts that I wasn't able to accurately do with my saw on site so I'll cut them at home and take the pieces out to install in the next week or so. So, without further ado, here's the interior of the cabin as well as my current plans for finish work in each picture. As you walk through the door, this is the first thing you see. Behind this mirror is a medicine cabinet of sorts where we keep everything from toothbrushes to keys to bear spray and sunscreen (don't mix up those last two please). I recently installed a clothesline across this tiny space (that's what the light bulb is hanging from here) so we have an out-of-view spot to hang wet rags and such. Facing the bench and mirror is a chalkboard. You're going to have to trust me that the height of the chalkboard works in this space. The door is immediately to the left of that. I still need to trim out the window and also want to hang a 2'-3' long coat rack below the chalkboard so my kids can hang up their jackets and hiking daypacks. There's storage here too. It won't be closed off, I'm getting tired of making (and then having to open) little doors. Next, moving on to the main gathering space. This is the living room and kitchen rolled into one 10' x 10' space. I need to trim out the windows and will probably put a shelf above each window so it almost looks like I framed them out upside down with the sill on top. I'd like a place for books and treasures. This is kind of low on my priority list at the moment though. Looking to the left, I have a cedar blanket ladder, hammock swing, and the heater. Of these items, likely the blanket ladder will be the only one to stay in place. I'm going to move the heater to sit just to the right as you enter this room. Above that will be a rack to set/hang things on when they need to dry out fast. I'd like to create a built-in couch or a modular system of some sort. I measured and can create seating that's up to 72" long to put under the window. I'm eager to get started on that project but need to make up my mind what I want it to look like first. Continuing to pan around the room, here are the stairs and the kids' sleeping cubby. Only one kid fits in there at a time while the other kid sleeps on the floor, or the dog bed, or on the dog. Once I can have the windows open and things dry out a bit outside, I will be painting the rise of those top stairs white and will either paint or stain the drawer fronts. The kids and I made those three drawers today as a little learn and build session. They thoroughly enjoyed the project and now they each have a drawer they can call their own. I'd also like to crate a door of some sort for the sleeping cubby but I can't quite figure out what to do. I'm going to hold off on figuring that out until I've created the seating that will be on the wall on the right side of the picture. I also see that I'm missing one row of wall board under the window at the top of the photo. Here's a better look in the sleeping cubby. It's plenty long for my almost 11 year old now but as he grows, we can pull out a storage bin from below, put a pillow or some foam on top of it, and it'll become an extend-a-bed. We will adapt as we need to. And now, the upstairs. There's another hammock swing upstairs, directly in front of the stairs but not making it difficult to move around. I installed a mosquito net canopy that looks beautiful now but will be super useful when the buggy season really hits. On the wall between the two windows there are two Ikea spice racks to hold books and necessities for those of us who sleep upstairs. Isn't it dreamy?!?!? We just couldn't get enough of this space once I hung up the canopy. We will eventually have a low bed frame, short headboard (to keep the pillows from sliding off the bed), and a real mattress but for now, the double height air mattress with a slow leak will have to do the trick. There's some finish work here and there but the upstairs is in pretty good shape overall. I'll leave you with one final picture from my trip out there with the kids. They are Sasquatch spotting.